If you are on social media constantly, you may find yourself posting from one social site to another. You may be posting the same updates on both Facebook and Twitter. What if you could tweet your Facebook status updates automatically so that you would not need to tweet the same post on your Twitter account? 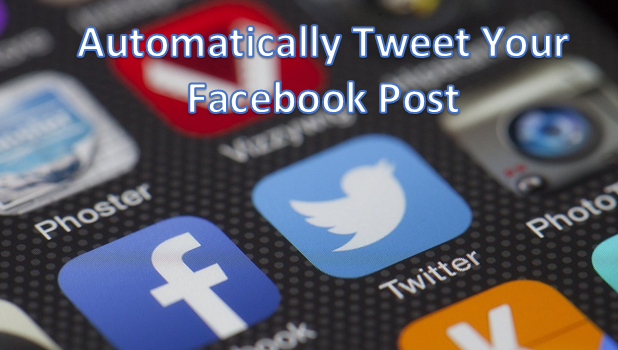 By following the steps outlined in this tutorial, you will find out how to tweet Facebook status updates automatically. 3.The application IF on your account – You can download IF from iTunes if you are on iOS, or you can get IF for Android from the Play Store. To tweet your Facebook status updates automatically on Twitter, follow the procedures that are outlined below. For screenshot purposes, I will be using an iPhone. 1.Go to your device’s Home screen. Android operating systems would have to go to the Apps screen. 2.From the Home screen, open IF. 3.On IF’s main page, tap on the recipe icon on the upper-right part of the page. 4.From the My Recipes page, create a new recipe by tapping on the + (Plus) icon on the upper-right part of the screen. 5.From the list of available apps, browse for Facebook, and tap on its icon. You can use the search button to locate the Facebook app easily. 6.From the list of available Facebook triggers, choose the New Status Message by You option. You may need to authorize and connect to Facebook. 7.You will be taken to the logic interface. This time, tap on the Action button. 8.Choose Twitter from the list of available apps and icons. You can also use the Search button for this as seen in the screenshot. 9.From the list of available Twitter actions, choose the Post a Tweet option. You may be required to authorize IF to use and connect to Twitter. 10.You can set a message format or set the post as is. Tap on the Next button to proceed. 11.Tap on the Finish button to create the recipe. 12.Your newly created recipe will now be displayed in your list of recipes. 13.Make a test post on Facebook to see if the recipe works. 14.Open your Twitter account and check to see that the same post is automatically tweeted on your Twitter account. You are done! You can also create a recipe where your tweets are automatically posted as your Facebook status. Use the same steps but set Twitter as the triggering app and Facebook as the app that does the action. Also, it is important to note the character limitation on Twitter to ensure that your tweets are complete. If you find something wrong with the steps in this tutorial, please drop me a message. Your help in making this article correct and updated is important.